In this article, we will show you, How to write a C Program to Sort Array in Ascending Order using For Loop, and Functions with example. 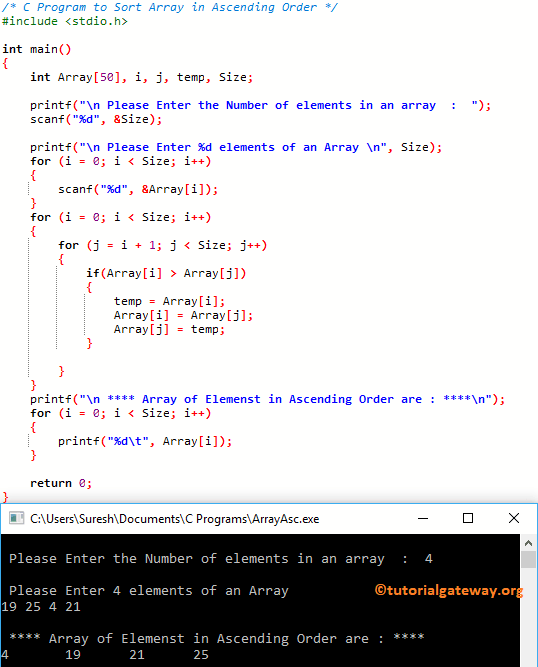 This program for sorting array in c allows the user to enter the Size, and the row elements of One Dimensional Array. It means, Condition is False so, it will exit from If block, and j value will be incremented by 1. Now the array will be 4 25 19 21. Next, j will be increment by 1.
if(4 > 21) – It means, Condition is False so, it will exit from the If block, and j value will be incremented by 1. Condition inside the For Loop is False so, compiler will exit from the For Loop. Next, i value will be incremented by 1. Now the array will be 4 19 25 21. Next, j will be increment by 1.
if(19 > 21) – It means, Condition is False so, it will exit from the If block, and the Second For Loop. This program for sort array in C is same as the first example, but we separated the logic to sort array elements in ascending order using Functions.